"I first heard of the Engen brothers when they were featured in one of our Fox Movietone newsreels some four decades ago. It was the only time we ever saw three skiers take off from a jumping hill at the same time. 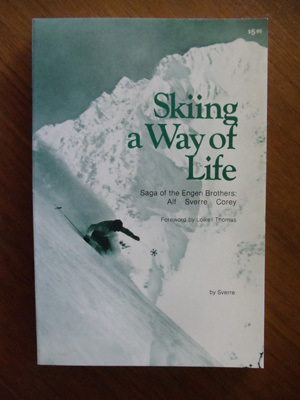 I wish all American skiers could ski with the Engens. Second best is to read their story as told by Sverre. If you are one of the millions who ski, you will be fascintated by his book." Lowell Thomas, journalist, from the foreword. "A friend told us that he once overheard some spectators talking as they watched us take part in the Snow Cup race at Alta (which Corey won three times). One said, "Here comes Car Engine." The other said, "Yes, and he's running smoothly on all eight." To which the first replied, "His brother, Spare, should be right behind him."